focused on analytics, investigations, discussions, and creativity. Editor and publisher Yurii Sheliazhenko. Language policy in Ukraine quickly shifts towards decline of traditional multilingualism and promotion of strong linguistic territoriality with mandatory use of the Ukrainian as official language in all spheres of public life. Bill on Ukrainian State Language, also known as Language Tyranny Bill No 5670-д, passed in first reading 04.10.2018 by the Verkhovna Rada of Ukraine, coercively imposes exclusive usage of the Ukrainian language in the press, media, business and civil society with a threat of criminal liability for disrespect of Ukrainian language. 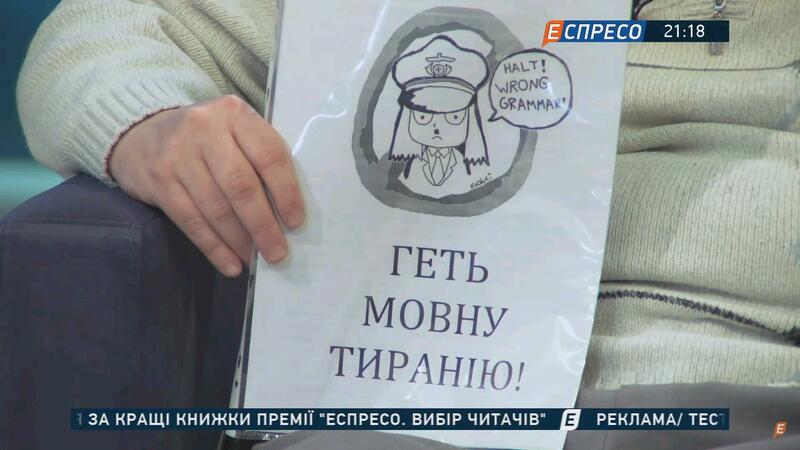 Also, the bill introduces total censorship of all imported books except published in the Ukrainian language. Most absurdly, Verkhovna Rada in the bill equates any discussion of official multilingualism in Ukraine… to violent coup d’etat! Answering to Yurii Sheliazhenko’s criticism at the talk-show Politclub, dictators of language policy used disgusting arguments. Mykhailo Holovko (MP, Svoboda Party) suggested ethnic minorities must go away into their countries, and furthermore, he demanded to prohibit scholars a public defense of doctoral theses in the languages of the European Union. Ihor Mosiychuk (MP, Lyashko Radical Party) proclaims that… nationalist interests are more important than human rights! National populists strongly combating personal autonomy in public communication. For example, according to Language Tyranny Bill, education and other public services must be delivered in Ukrainian; current imposition of Ukrainian language quotas on broadcasters by licensing policy is to be tightened with the demands to publishers and website owners to make or translate all information in Ukrainian, so oldest Ukrainian newspaper in English, KyivPost, may be discontinued, as well as part of international scientific journals published in English. Forced Ukrainization causes a crisis in international relations of Ukraine, postpones perspectives of Euro-Atlantic integration, outrages European countries represented in Ukraine by significant diasporas (Hungary, Poland, and Romania), disenchants sympathizers of Ukraine among Russian liberals, inflames armed conflict at the west of Ukraine, broke peace-building process. Last decade Ukraine radically changed attitude towards Russia, rejected Soviet legacy with all illusions of friendship, ruined by mass and systemic Kremlin deceptions, and started to oppose Putin’s empire avoiding any possibility to become again part of a rebuilt prison of nations. In the first years of independence, Ukraine preserved formal multilingualism with special privileges of state language given to Ukrainian. Answering to Russian agenda of use Russian-speaking identity for mobilization of compatriots around the world to support neo-imperial project, Ukrainian nationalists actively push their agenda of protection and promotion of Ukrainian language, wrongly concentrated on measures of compulsion and coercion, without creation of attractive Ukrainian-speaking sources and spaces, needed to restore trust and hope among people, establish honest democratic dialogue in society, and help Ukrainian-speaking people to participate in the contemporary technical and cultural progress with easy public access to achievements of science and arts in mother tongue. Language problem was a factor of political mobilization during 2012-2013 events caused Revolution of Dignity and seen as casus belli on both sides of the hybrid war between Russia and Ukraine. From Moscow point of view, Russian-speaking people in Ukraine are deprived of linguistic rights and deserve protection against attempts of compulsory assimilation by the aggressive ethnic nationalists. For the contrary, from Kyiv perspective multilingualism is a legacy of oppressive imperial russification that must be overridden. Principles of linguistic justice were sacrificed for the sake of lawfare agendas in cases of 2012 Law on the Principles of the State Language Policy, 2017 Law on Education, and passed in first reading 2018 Bill on the Support Functioning of the Ukrainian State Language. Policy window is opened for changes since amendments for 2018 Bill still can be proposed (and will be proposed, because the bill was radically criticized both by supporters of mono- and multilingualism, by human rights defenders etc), as well as alternative bills are registered. Oligarchic and bureaucratic lobby advocates measures of linguistic compulsion to concentrate more power and money in own hands holding total control over existing rigid and corrupt national cultural institutions, but innovative businesses and civil society dedicated to reforms interested rather not in restrictions (except of inevitably needed for national security), but in linguistic justice, free speech, creative and academic freedom allowing to awaken and fully dispose competitive powers of Ukrainian-speakers. National populist lawfare agenda in linguistic policy needs significant correction towards linguistic justice to preserve perspectives of Ukraine’s successful participation in human development within cosmopolitan nation of whole human race, based on common heritage, such as the planet Earth, universal human rights, peace-loving foundations of international law, and multiple languages created by people starting with common, universally recognized languages of music, dance, painting, and mathematics. © 2008-2019 Pravdoshukach (The Truth Seeker) Liberal Newspaper. Незалежна газета "Правдошукач". Независимая газета "Правдоискатель".